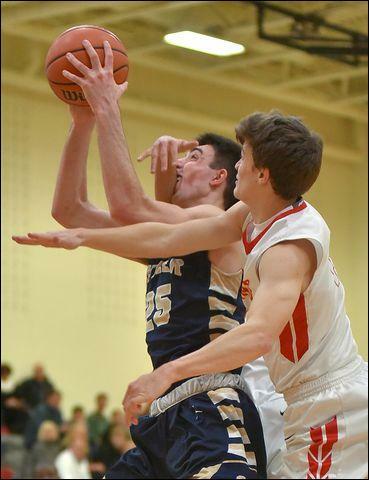 Cardinal Wuerl North Catholic defender Michael Drambel, front, does all he can to prevent Butler's Ethan Morton (25) from getting off a shot during the Golden Tornado's 51-47 basketvball win Saturday night. CRANBERRY TWP — The outcome was welcomed. Its method was not a surprise. At least, not to Butler boys basketball coach Matt Clement. The Golden Tornado (10-1) survived seven ties and 10 lead changes at Cardinal Wuerl North Catholic in defeating the Trojans, 51-47, to close out the Don Graham Classic. Neither team ever led by more than five points. “They (Trojans) have won a lot of games in this gym and in their old gym in Pittsburgh by turning them into scraps,” Clement said. “They know how to win ugly. CWNC's last lead was at 46-45 with 3:56 remaining as John Fukon stuck back an offensive rebound. The Tornado got the lead back for good when Luke Michalek stuck back an offensive board 15 seconds later. Trailing 49-47 with less than a minute to go, the Trojans (4-6) had possession. Ryan Feczko missed a three-point shot, however, and Ethan Morton salted the win away with a pair of free throws with 27 seconds left. The Trojans tallied 22 field goals to Butler's 15. The Tornado buried eight treys to CWNC's one, however, and the Trojans did not get to the foul line until the fourth quarter. “We didn't attack inside enough,” Long said. “When you work the ball around the perimeter and don't penetrate, you're not gonna get to the line. For the second time in as many nights, Butler struggled from the field. The Tornado shot just 33 percent. Morton was named his team's Graham Classic MVP despite hitting just five of 17 shots from the floor. “We're in a bit of a funk right now,” Morton admitted. “I was bad again, but we're finding ways to win these types of games and that's good. Morton led Butler with 20 points, hitting four treys. He had seven rebounds, four assists and two steals as well. Mattix Clement finished in double digits for the second straight night, scoring 12 points and hitting three treys. Tarik Taoufik had nine points and six rebounds, Michalek six boards, three assists and a pair of steals. “We're doing a better job of boxing out now and getting our share of rebounds,” Clement said. “North Catholic's players cut well and they run their sets and find the open man. You have to be very aware defensively. Brian Daviddson paced CWNC with 13 points and five assists coming off the bench. Jackson Paschall had 12 points, Fukon 10 points, four rebounds and three assists. Butler had a 29-22 edge in rebounding. “We needed to do a better job on the boards to win this game,” Long said. Butler will return home Tuesday night for the first time since Dec. 22, hosting Altoona. “It will be nice to play a game in our own gym. We haven't been there for a while,” Clement said. Luke Michalek 2-5 2-4 6, John Michalek 0-2 0-0 0, Mattix Clement 4-10 1-2 12, Tarik Taoufik 3-6 3-6 9, Luke Patten 1-5 0-0 3, Ethan Morton 5-17 6-10 20, Dom Schmidt 0-0 1-2 1, Isaiah Scribner 0-1 0-0 0. Totals: 15-46 13-24 51. Brian Davidson 6-9 1-2 13, Michael Drambel 3-5 0-0 6, Joe Meinert 0-1 0-00, John Fukon 4-8 1-2 10, Jackson Paschall 6-7 0-0 12, Ryan Feczko 3-11 0-0 6, Zach Rocco 0-0 0-0 0. Totals: 22-41 2-4 47.